You're in the Ice Age, where mankind battles for survival. The weather is harsh. Gigantic beasts, and your own savage cousins, surround you on every side. You have no Uzis or bulletproof vests, no automobiles, no penicillin, not even as much as a match (or a Fire spell). You have only your wits and the weapons you can make by hand. An overview of the Pleistocene Epoch, the dawn of mankind. Detailed information on seven hominid races – Australopithecus gracilis, Australopithecus robustus, Homo habilis, Homo erectus, archaic Homo sapiens, Neanderthal man, and Cro-Magnon man. Character creation and roleplaying for all races, including new advantages, disadvantages and skills. A system of primitive magic – Shamanism – with its own spells. 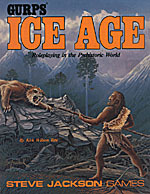 A bestiary of Ice Age animals – including dinosaurs, for a "Lost World" adventure. 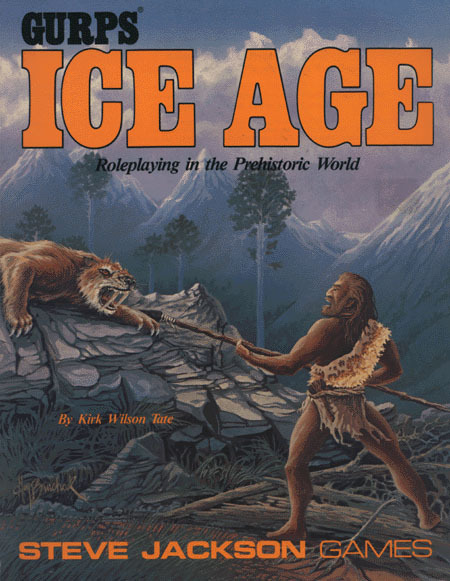 A complete adventure pitting Neanderthal tribesfolk against Cro-Magnon invaders. A full background for a realistic or romanticized prehistoric campaign. A guide for primitive tribes in a post-holocaust campaign. A sourcebook for a lost realm in a pulp or adventure campaign. A "primitive" world for an outer-space adventure. Or, for a change of pace, try cave man slapstick, with dinosaurs, giant bugs, big clubs, and ancient astronauts! This book is designed for use with the GURPS Basic Set, Third Edition, but can be used as a sourcebook for any other roleplaying game system. GURPS Dinosaurs – The ultimate sourcebook for introducing the "terrible lizards" of eons past to your roleplaying game! Hundreds of dinosaurs, described with complete scientific accuracy. GURPS Lands out of Time – Humans and dinosaurs go together like gamers and pizza. That tens of millions of years separated the last of the dinosaurs from the first of the humans is a mere inconvenience, easily ignored.